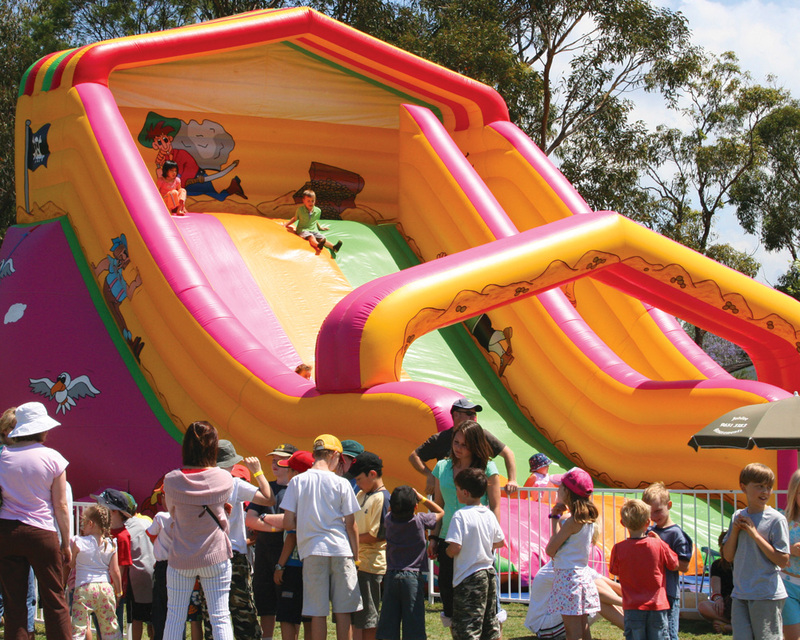 Jubilee is Australia's number one supplier of Amusement Rides and Inflatables. We have been delighting tens of thousands of children in the greater Sydney, Brisbane, Gold Coast and Northern Rivers areas for over 25 years. If your organisation is planning a fete, fair, picnic day, promotion, Christmas party, or special event, consider something new, exciting and different to keep the kids entertained. We offer a great range of services, in a safe and professional environment, at affordable prices. Whether you need just a jumping castle or a full carnival, we will ensure that your day is an occasion to remember! Always first with the amusement rides! As we are importers and distributors of most of the rides we feature on this website, we can guarantee that you'll get the very latest designs, and they come to you looking brand new. 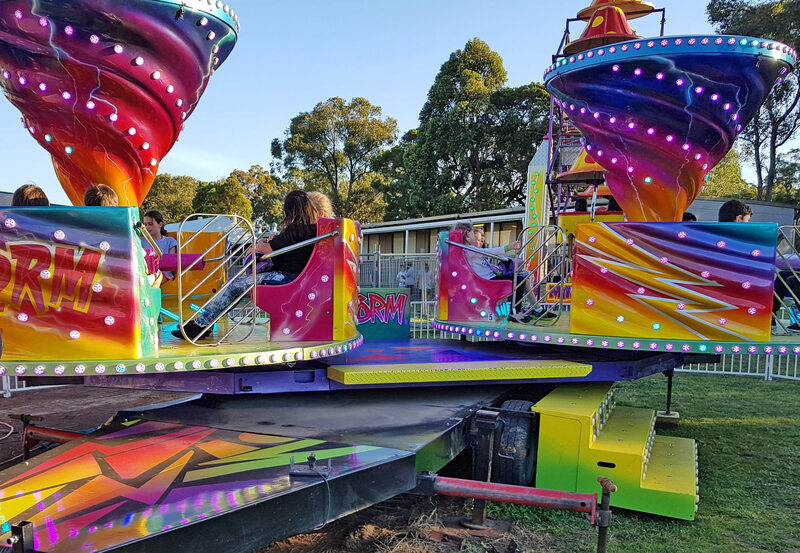 Just what rides suit your particular function will depend on a number of factors, including the number of kids attending, their age range, whether it is a profit raising event, space available, vehicle access, and of course budget! Remember that amusement rides must be attractive to the potential customers, and must have good throughput. Otherwise you'll have difficulty in making enough money to cover the cost of the rides, and you’ll have long queues. 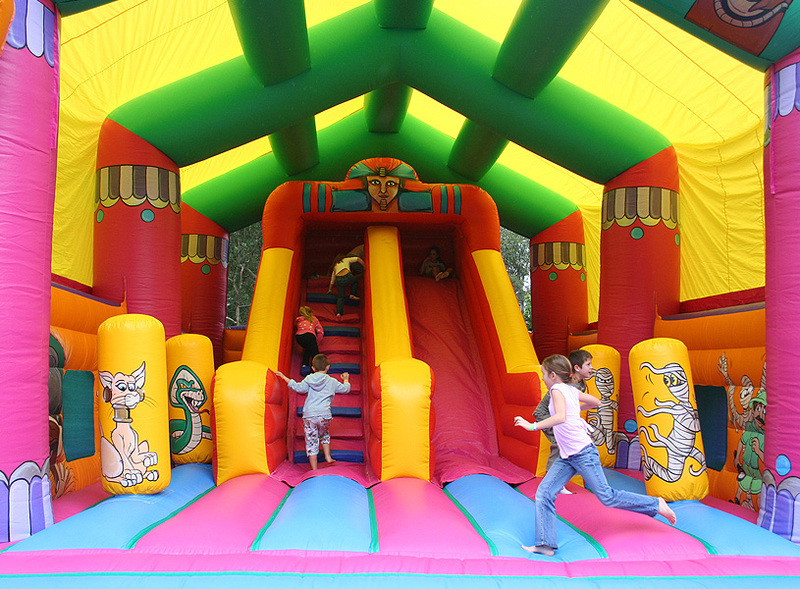 Our quality inflatables come in all shapes and sizes, from castles to multi-activity rides. They are a must at every event, as they represent the most fun you can get dollar for dollar. We have small castles and slide/castle combos that will fit practically any space, through to the giants like Lost Temple and Dragster Slide. Of course the designs are far removed from the simple ones that we began with 20 years ago. Kids love the bright colours, the jiggly movement, and the freedom to jump and play in a big, soft, bouncy house! Given half a chance, many kids would stay ALL DAY in our inflatables. They certainly are the best choice for small events, and are a great compliment to mechanical rides at even the largest event. 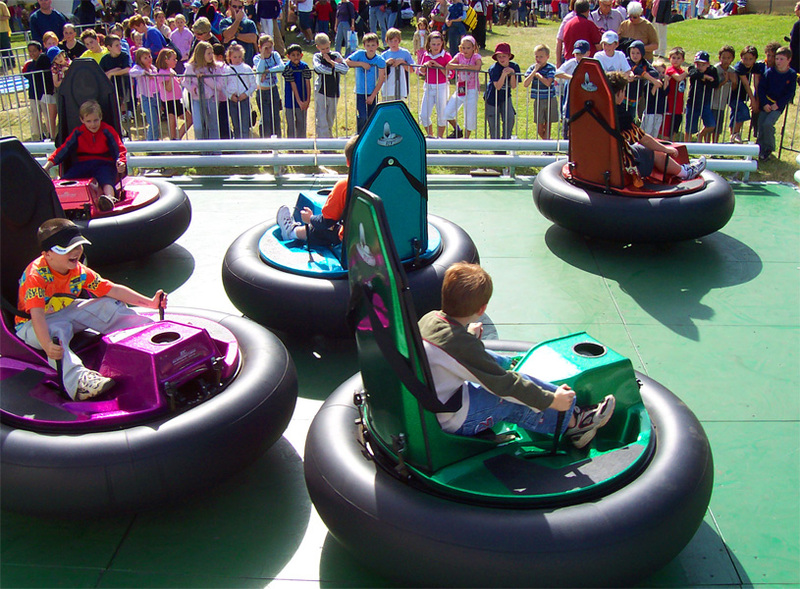 Large mechanical rides like Storm Ride, Wild Rider, and Dodgems are hugely popular with primary-age kids to teenagers, and even adults. If you have the crowd to justify them, they'll provide enough thrills and excitement to keep everyone happy. Once upon a time the most thrilling attraction you could hire for a fete was a merry go round. Boy, how things have changed! 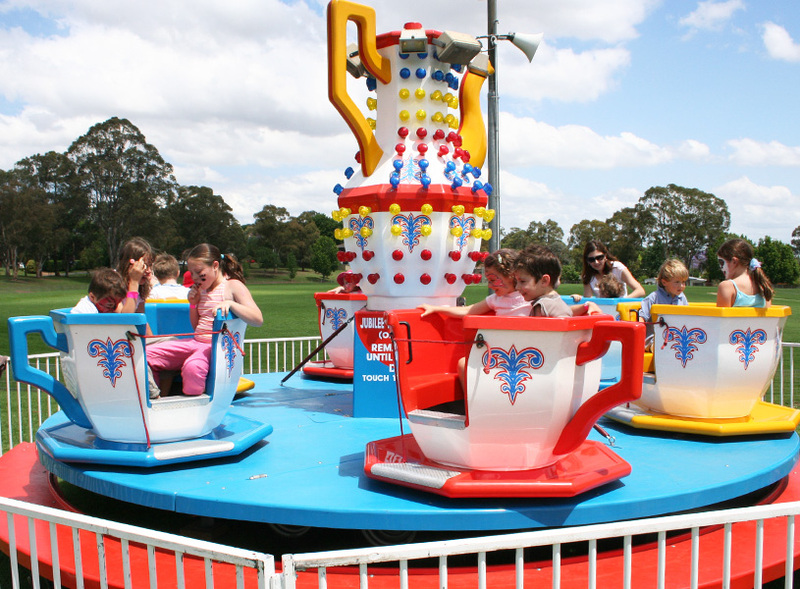 Modern kiddies' rides like Cup & Saucer and Swinging Pirate Ship entertain toddlers and primary-age children. Add one to a good inflatable or two, and you have a great package for most events, including school fetes. 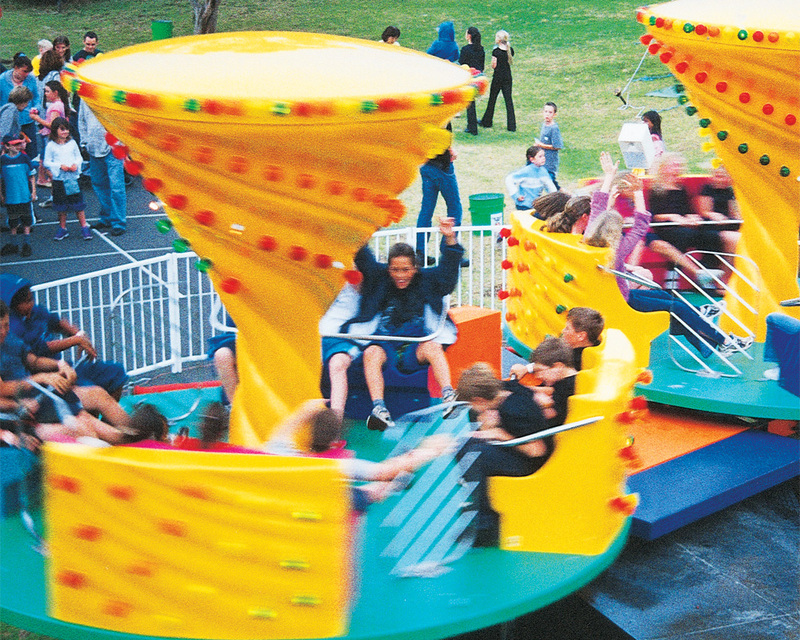 The Superslide has been a "must" at larger events for years, as it has a throughput of around 250 riders per hour. It can take any age from toddlers to adults, so Mum or Dad can ride with littlies. We have Mini Jeeps, Krazy Kars, and Dodgems. Every child loves to drive, so any one of these rides is a guaranteed success. 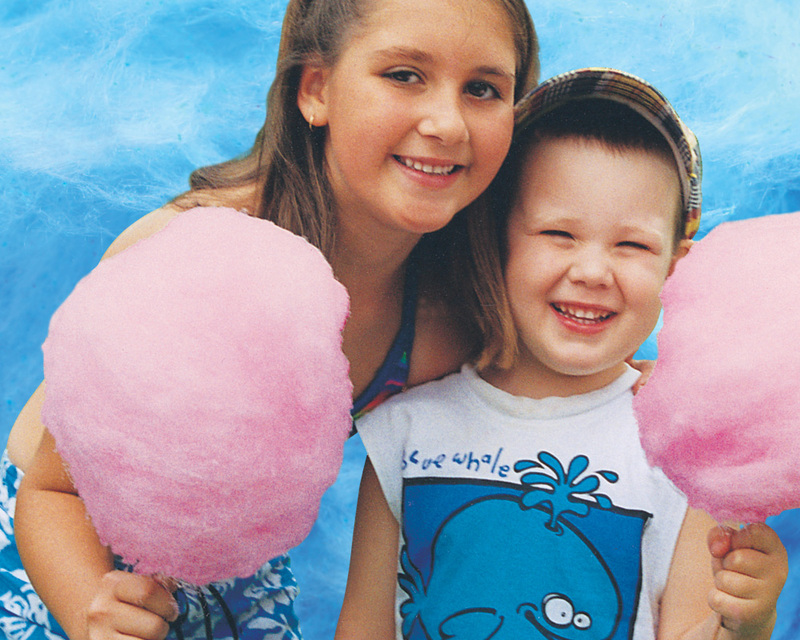 A fete is just not a fete without Fairy Floss. We have Snow Cones too. Profit share or fixed fee? We'll send you a price list on request. In it are the individual hire prices, and package prices on selected groups of rides that go well together. The hire price includes all set-up costs, supervision by our trained operators, lighting of the rides at night, and GST. Generators are included with some rides, but otherwise can be hired at $35 to $75 per day. Many schools opt for hiring rides on profit share rather than by paying the hire fee. If all goes well we stand to make more on this basis than we do on hiring at a set fee, so we are happy to oblige. However, the advantages to the schools are that they don't risk a cent on wet weather or any other factor influencing the size of the crowd on the day. What makes a good fete? 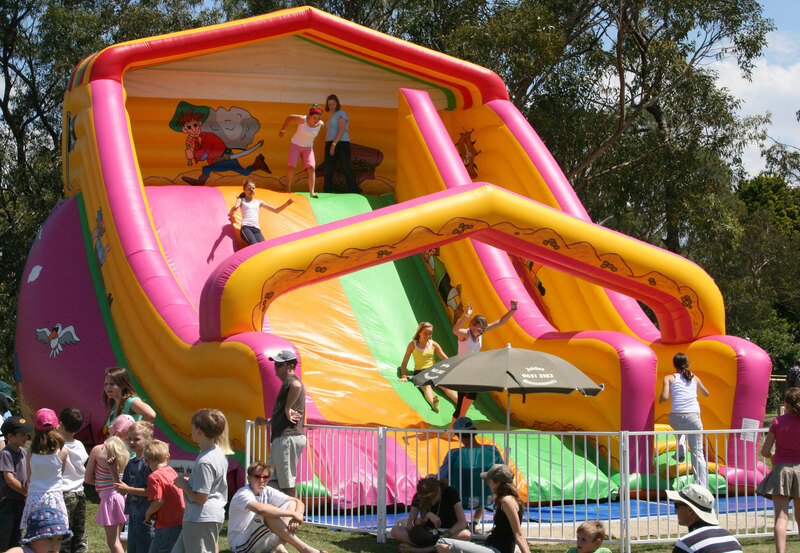 We hire amusement rides for lots of school fetes, and other fund-raising events, and have done for over 25 years. We've learned a few things in that time. Amusement rides are important. They encourage the kids to come to an event, and they encourage them to stay. But, they are not the only entertainment you need. Whilst media and sporting personalities are good to have, the best way to ensure that kids come to the event is to involve them in the entertainment, (like singing, dancing, sports demonstrations, etc). Many schools give each class the responsibility to look after a particular part of the fete. Chocolate wheels and cake stalls might sound old-hat, but if someone donates the prizes and other goods, then the sales are 100% profit for you! Be careful with car boot sales, art exhibitions, and reunions: the oldies might love them, but kids don't. Attendance at that type of event is rarely as good as the genuine fete. Day passes are a good way of improving your income AND at the same time giving the kids maximum value for their dollar. Some schools pre-sell them at a small discount. Obviously any child who does buy a day pass WILL come on the day. Once confirmed, inform other school and Festival committees in the general district of your fete and the date chosen. 3 Book the amusement rides: Select an amusement operator who can provide a quality product and professional service. Your decision should not be influenced by high-pressure sales tactics or cheap “giveaways”. Ask the operator for a list of events they are attending as see them “in action”. There’s no better way of ensuring you are getting what you are promised, and what the committee is paying for! 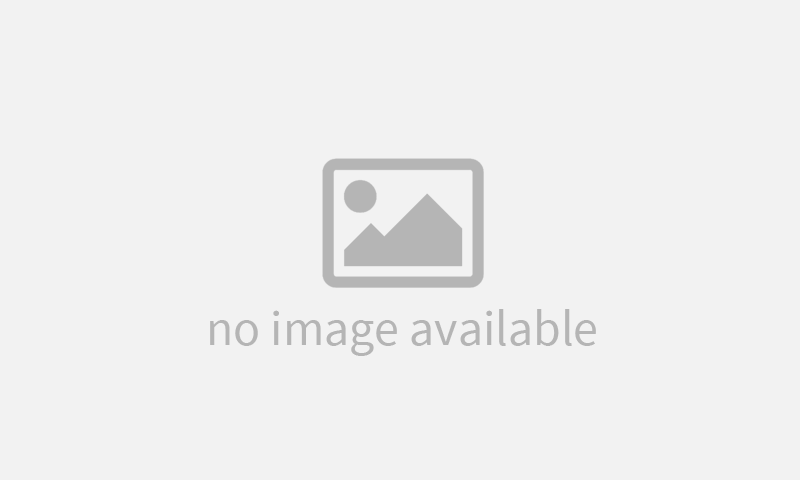 4 Research: Source all available information of previous Fetes held at the school. Ex Fete Convenors are the best place to start. Find out what worked and what didn’t. A Fete/Fundraising file should be kept by all P&C/P&F Committees. If not, establish one for your reference, and that of future committees – otherwise, enormous time and effort can be wasted “re-inventing the wheel”! 5 Visit other Fetes in your area: this is not “spying”, just the “sharing of ideas” and can be a great source of potential performers, entertainers, suppliers, donations, & sponsors. 7 Develop a Map: A map of the school grounds & oval can be drawn identifying the location of all stalls, food, entertainment & rides. Atmosphere is essential. Ensure the layout is not too spread, though allow enough room for public thoroughfares and queuing. The availability of power is a major determining factor in the layout. Whilst the rides are normally self-sufficient, many of the stalls & food activities will require power, especially those with heating elements such as Fryers & Urns. An electrician may be required to confirm power supplies, especially in older schools where “tripping” can be a common and frustrating problem on the day. An on-site meeting with the Amusement operator is recommended. Issues such as area requirements and access can be confirmed. Have a “wet weather” or fall-back plan available, in the event of the oval being wet and inaccessible. This may involve re-locating the stalls around the school buildings, with the rides operating in the car park. 8 Promotion/advertising: The big advantage schools have over community based organisations is the children enrolled – this is a “captured audience”. Encourage all students to attend the fete through their involvement in performances; the purchasing of “pre-sold” ride passes; & the assisting with stalls. Other conventional forms of advertising are required to attract the greater community. Banners, signs, newspaper articles, leaflet drops, & radio are all effective methods of “spreading the word”. 9 Financials: Set aside a secure area such as the main office, for the collection and storing of money. Each stall or activity should have it’s own collection bag, and a column in the Accounts Book, for the recording of takings throughout the event. 10 After the Fete: Once the event has finished, acknowledge & reward those volunteers who gave up their time to ensure your event was a success. A BBQ is a great way of using up left over food and is really appreciated by the helpers. “Thank you” letters and Certificates of Appreciation can be sent to sponsors, plus organisations who donated goods. With over 25 years of committed service to the industry, (including a number of terms on the boards of two industry bodies, Sydney Portable Ride Operators, and the Australian Amusement Association), our experience, dedication, and reliability is second to none. There is no substitute for quality or the peace of mind in dealing with an established and reputable firm. If you hire a particular ride for a certain time on a given date, then that’s what you’ll get! All our rides are regularly inspected, are registered with the WorkCover Authority (where required), and are insured (via Lloyds of London) for $20m public liability. 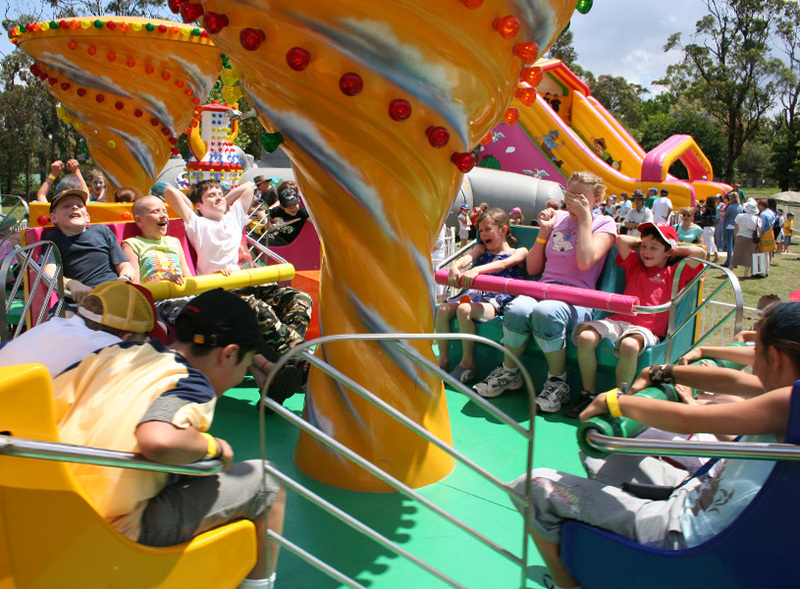 Jubilee Amusements has been supplying rides in the Sydney region for 25 years, and our reputation is second to none. You won't get a jumping castle designed for a backyard party or an old merry-go-round for you fete. You'll get exactly what we show in these pages. Every installation will be done properly so that safety of all concerned is ensured. You'll get proper fencing, gym mats, tagged leads, and the supervision that is required by both commonsense and Australian Standards. Jubilee - the very best in Amusement Rides and Birthday Party Castles.